Mysterious Yarns: TV Drama - US or UK?? 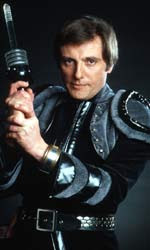 youth, through ST:NG and Deep Space Nine. I kind of drifted away from SF round about Star Trek: Voyager, though I have dipped in and out of that too. I picked up on Stargate Universe, because I like Robert Carlyle, though I'd never watched any of its previous incarnations. I'm currently eagerly awaiting its return from a mid-season break. (Why does US TV do that - it drives me nuts). I'd been hearing good things about the new series of BG though and succumbed to a great deal on the complete boxset. There's really not much better than a good, well structured, well-written, TV series that doesn't feel the need to talk down to its audience. Geek TV and knitting go so well together too. I did almost all my Christmas knitting on my days off while watching Starbuck fall apart on BG. This is why I prefer a DVD boxset of a series - I can watch as many as I like back-to-back without having to wait for the TV schedulers to provide my fix. they do produce some great stuff. I am already in love with Sky Atlantic. 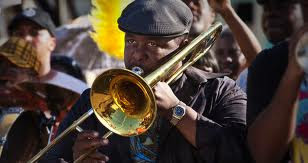 Totally the best thing on TV at the moment - Treme. A series about New Orleans, set in the area called Treme where lots of musicians lived pre-Katrina, and following a group of people trying to put their lives back together in the wake of the hurricane. I love it. It's fantastically well-scripted, but even if it wasn't, the music is wonderful. It makes my week. The boxset of this will be available soon so I can heartily recommend it, and a second season has already been commissioned. hopes for Outcasts, the BBC's first foray into SF for quite a while, and I could see what they were trying to do with it. Definitely aiming for the BG audience and with Jamie Bamber in the first episode. But ultimately it was a disappointment. It had that old BBC need to pander to the audience and explain things that really we had already understood. If you're aiming an SF series at people who are already literate in that genre then it's really not necessary to state the obvious at every turn. It used a lot of the same themes that BG used - escape from a doomed planet, the sense of history repeating itself, a humanoid appearing people in conflict with humans. But the handling of these issues was very ham-fisted. Some of the acting was distinctly ropey too, which didn't help. Anyway, no-one watched it, it got swiftly shuffled off to a late slot on BBC2 and has now been cancelled. The Killing - OK, so they didn't make it, and they put it on BBC4 so they haven't pushed it too hard, nor did they shout about it too much. It was people on twitter that alerted me to this series. And I was a bit dubious - it's a 20 part series, set in Copenhagen, about a murder - yes all 20 episodes, just about the one murder, and it has sub-titles because I don't speak Danish, which means I can't knit while watching. But let me tell you - it is utterly fantastic, totally gripping and if the BBC don't repeat the whole series on a more mainstream channel then they are just as much the fools I always thought they were. I have been watching this on iPlayer on my laptop (with a small screen) because I missed the first episodes and have been desperately trying to catch up, and even in that format it is fantastic. It finishes on Saturday. I can't wait. Just one more thing to say - BBC, please do not try to make a series like The Killing. All the evidence shows that you are incapable of doing this. Here's a suggestion though. Commission more from the quality writers you already use like Steven Moffat and Mark Gatiss. How about something steampunk?